Part of the allure of the Traverse City Film Festival is all the wonderful activities already in the Grand Traverse area, a valuable part of any Film Fest itinerary. One can book a stay at Shanty Creek Resorts and visit the Film Fest parties, movies and panel discussions, then return to the peaceful vistas of the three villages of Shanty Creek—Summit, Cedar River and Schuss. 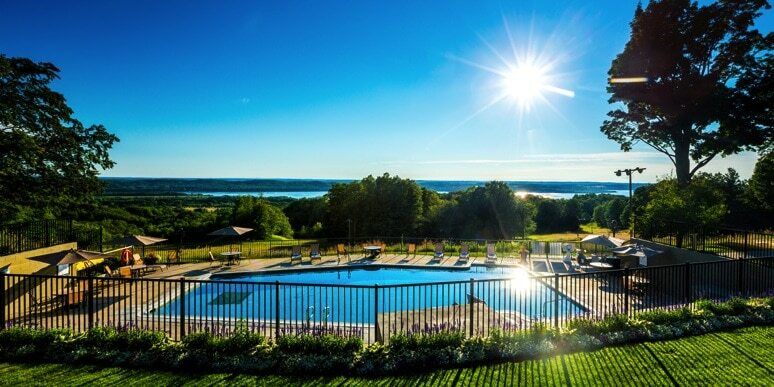 Whether one prefers a well-appointed hotel room, condominium or a rental home as your vacation base, you can round out your trip to the Traverse City Film Festival with fun in the sun—a couple rounds of golf or family activities. Want to see a film for mature audiences only? Leave the kiddos at Shanty Creek! Shanty Creek Resorts maintains a roster of childcare providers who can meet your family’s individual needs for evening child care. The kids can take advantage of the playgrounds, pools, junior golf, sports like basketball, soccer or tennis or a slew of lawn games. Meanwhile, you can enjoy a film, a dinner out or a stop at Short’s Brewery in Bellaire. Or take the whole family to the Film Fest! There are kids movies and other kid-friendly events throughout the Festival. And cap the evening off with a movie and a picnic at the Open Space on Grand Traverse Bay. Shanty Creek, a supporter of the Traverse City Film Fest for years, has sponsored the Sunday night Open Space screening of The Lego Movie, in keeping with its commitment to family vacations. And if you’d like the kids closer to their cozy bed, especially if you expect to carry them to it after your outdoor screening, join the crowd behind the Lakeview Hotel at dusk for a family-friendly movie, right at Shanty Creek on summer Saturday evenings. After your cinema appetite is satisfied, you’ll want to stretch your legs. Shanty Creek Resorts offers four distinctly northern Michigan golf courses including Arnold Palmer’s The Legend, Tom Weiskopf’s Cedar River, the challenging Schuss Mountain course and the original Summit G.C..
Or explore Northern Michigan by bike from Shanty Creek. Pedal through the lush forests of Glacial Hills, take a road ride over gentle hills along Torch Lake Drive, alongside the turquoise blue. Want something easier—try Shanty Creek Resorts’ fleet of e-bikes, the first of their kind in Northern Michigan. It’s a seven-speed traditional bicycle with a boost: it also includes a battery-powered 4-speed motor that assists with each crank of the pedals. So not only can you ride down to Short’s Brewery, you can easily get back up the mountain to your accommodations! Of course Northern Michigan’s waterways, a natural backdrop to any festival Up North, are worth the trip. From your base at Shanty Creek, you’ll want to include a visit to Michigan’s Chain of Lakes, featuring beautiful Torch Lake. Or venture a little farther to the shores of Lake Michigan. Whether you want to splash in the sandbar made famous by Kid Rock, fish for walleye and trout, or paddle your kayak in the mild rapids of the Jordan River, it’s all available from Shanty Creek Resorts.